With limited countertop space in many apartment and small home kitchens, home chefs are often forced to decide between appliances. Two appliances, a blender and a food processor, are the main competitors. Although they both have rotating blades, they have different designs and strengths, while maintaining some overlap in the tasks they can complete. A blender is a countertop appliance consisting of a stand motor and a tall and narrow pitcher with a lid on top and blades in the bottom. 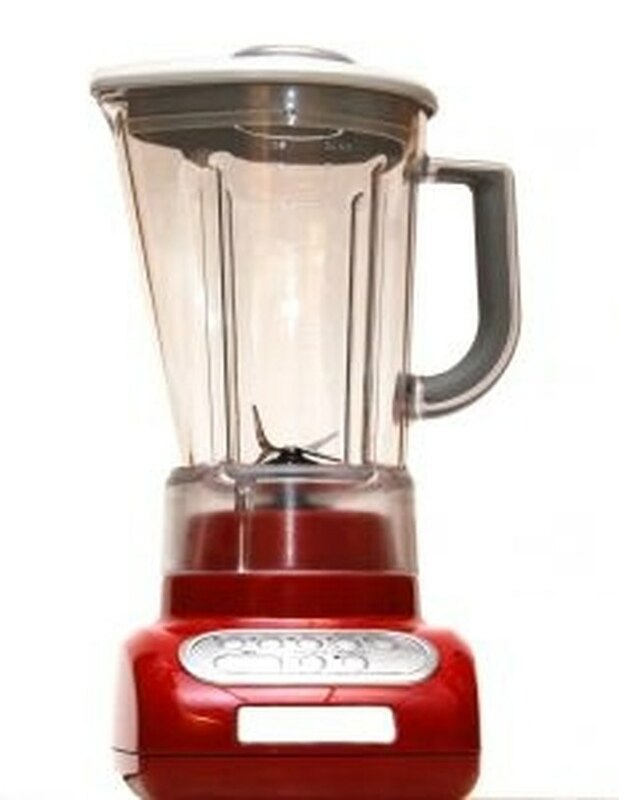 A blender's blades move very quickly, turning as many as 18,000 times per minute, and most blenders allow you to control their speeds, from a low chopping to a high-speed puree. The other major countertop appliance is a food processor, which comes with a number of different kinds of blades. You will most often use the S-shaped chopping blade, but most processors also include discs for kneading, slicing, grating and pureeing. The typical food processor only has one speed, although it also has a pulse button that affords you more control. The best way to use a blender is with liquids. They are an essential appliance at establishments mixing alcoholic drinks and making blended coffees. At home, they make such drinks as smoothies and milkshakes, and a high-powered blender can even grind ice. Another common use for blenders is soups--either pureeing soups that are cooked on the stove or starting with raw ingredients and mixing and heating the soup in a blender on high speed. You can think of a food processor as a very fast knife and cutting board. The major advantage of a food processor is that it will slice and chop ingredients much faster than the average home cook can, saving a lot of preparation time when making meals from scratch. Food processors will also grate cheese, allowing you to purchase blocks instead of preshredded bags of cheese. Blenders and food processors perform some tasks almost equally well. The first is pureeing, which both appliances were designed to do quickly and easily. The main difference is that a blender makes a smooth puree, and a food processor, with its pulse feature, can make a puree with some chunks if you want to maintain texture. The second major area of overlap is bread crumbs, which a blender with a dry blade can make as well as a food processor. A discussion comparing blenders to food processors is incomplete without addressing the third major countertop appliance: a stand mixer. Although stand mixers are not as versatile as blenders and food processors, they excel in three major areas. The whisk will whip cream or egg whites in a minute or less. A stand mixer's flat beater is perfect for cake batters and cookie dough. Lastly, stand mixers with bread hooks can knead dough more slowly and effectively than food processors. What Are the Functions of Food Processors?